Around-the-world sailor Brec Morgan of Milford poses alongside his boat, Otter, after sailing into Old Harbor on Block Island on Saturday, May 17, 2003. He displays a bottle of seashells collected by Joshua Slocum in the West Indies in 1906; they accompanied him around the world. 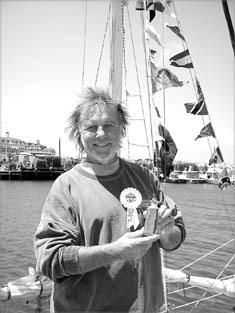 New Shoreham, R.I., 5/17/03 (AP) — When Brechin Morgan set sail from here more than four years ago to circumnavigate the globe, he promised to celebrate his return with a pint of Guinness. On Saturday, the 56-year-old sailor from Milford, Conn., raised his beer glass to cheers from hundreds of friends, who gathered at a dock in Old Harbor to congratulate him on his voyage. Morgan appeared tanner, thinner and more confident than when he left Block Island in November 1998. “During this trip I made a connection to sailors from long ago and far away,” he said. Morgan made his journey in a 27-foot cutter-rigged Pacific Seacraft. The boat, which he named Otter, is decorated with small flags from the more than 50 countries he visited during the voyage. Morgan sailed into Old Harbor just before 1 p.m. on Saturday, triumphantly sounding the boat's horn as he neared the dock. Applause, balloons, cheers and clicking cameras greeted him. Morgan's wife, Sandy, was among the well-wishers. She also visited him at ports around the world. Relatives from Washington and Arizona also made the cross-country trip for Morgan's return. An artist and retired sign-painter, Morgan made the voyage on a shoestring budget. He painted watercolors throughout the journey, selling several to help offset his costs. Morgan said he set out on his journey to see the south Pacific and experience different cultures. After the initial greetings, Morgan displayed a bottle of shells collected by the first person to sail around the world alone, New Englander Joshua Slocum. Slocum completed his journey in 1898. Morgan's grandmother was given the bottle by Slocum, said Morgan's father, John Brechin Morgan. The younger Morgan carried the shells with him throughout the trip. Later, Morgan was inducted into the Golden Circle Club by the rear commodore of the Joshua Slocum Society International, Mike Martel. The Golden Circle Club includes sailors who have made a fully documented solo circumnavigation of the world. “It is a tremendous personal achievement that tests you mentally as well as physically,” Martel said.